• There is a real, physical, sensation which accompanies change. Fear and anxiety may result when you are not aware of what is occurring. • People are able to habituate. This frees the conscious mind for creative pursuits. • Habits of activity, thinking, and feeling are created. Habits can be positive, negative, good, or bad. The process is neutral. 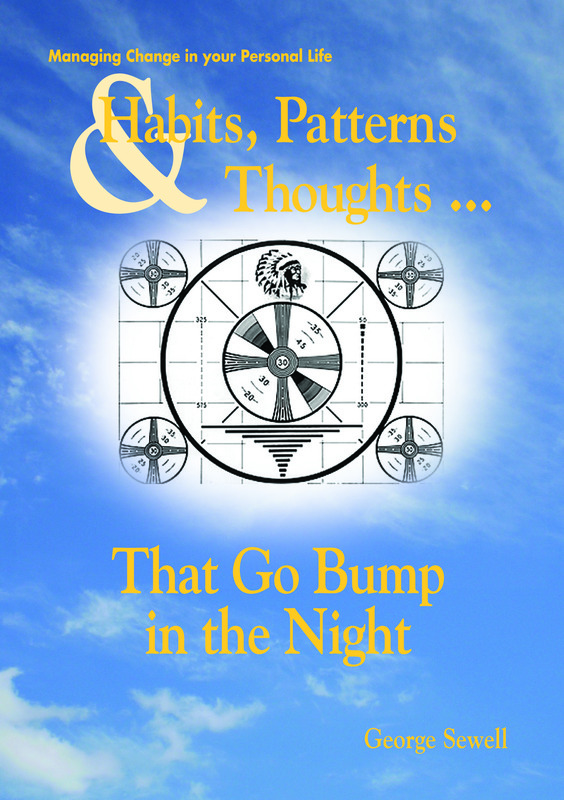 • Patterns are the cyclical events which are driven by the collected habits over time. Patterns may be difficult to notice at first—similar to not seeing the forest for the trees. • Managing fear results in a positive experience. It’s true. Learning how to manage fear, even if not overcoming it, enhances self confidence. Fear never completely exits your life, for no other reason than there are always shadowy corners in life, and you don’t know what’s on the other side. It’s a great motivator. • Expectations are created when thinking habits meld with feeling habits over time. Expectations are extremely powerful. In a battle of what one expects versus what one desires, expectation wins. • People are created free and instinctively resist being forced to do something. The more free a person, the greater the sense of identity. The greater the sense of identity, the greater the demand for freedom. Sadly, the converse is also true. • Time will pass. Use it, it’s your friend. A part of human growth and development is to look back in time and assess your life. Perspective. • If you know what is important, the rest is simple. • Simple does not equal easy. • HANDS. When in doubt, clasp your hands one way, then the other. It’s a good reminder that much discomfort and unease is a result of some re-arrangement, or change in your life. • The Problem is not the Solution. If the problem never seems to go away, or if nothing really changes despite your hard work, then mentally step back and see if you are, in fact, wanting the problem to stop being a problem. Especially if the problem is a person. • An irrational idea, passionately held, is still an irrational idea. Use this tool often. Are you demanding that people, or the world, get its act together in order for you to feel good? This is a path to insane behavior. • Do I want to wreck my neighbor’s car? A handy thought to use whenever you feel angry or resentful. What do you want? Happiness for you, or for others to suffer? The two are not synonymous. Your energy should benefit you, not the S.O.B.s out there. • Habituation occurs whether you are aware or not. • Stubborn is not a virtue. • Don’t break a habit; replace it. • Good Grief—using the spiral of time for healing. • An irrational idea, passionately held, can cause weird behavior. • Strong emotions are associated with memory. Forget about being able to forget. • Perspective—cause and effect and delayed gratification. • Don’t try, do something. Or don’t do it. • Consciousness is a terrible thing to waste. • Worry feeds on indecision. Don’t discount the rich cultural history and wisdom that has been passed along as adages. You don’t have to reinvent the wheel of knowledge. • Humans are creatures of habit. • Birds of a feather really do flock together. • You really can’t make a silk purse out of a sow’s ear. • A stitch in time saves nine. • Making a mountain out of a mole hill. The concepts and tools presented in this book can help you develop a greater sense of personal freedom and confidence. This is achieved by learning to become more aware of what you think, how you feel, and what you are doing right now. You may have developed a habit of not paying attention to these matters. Your power to change is in this moment. Time won’t back up for you. It will not skip forward so you can see the results of today’s decisions and behavior. Of course you can devote your time and energy in those attempts. But why? Nobody says that you must continue living with habits and patterns that no longer work for you. You have the power to choose what you do. The only obstacle to gaining more control over your life may be a reluctance to invest the time and energy to make a change. Perception is reality. • What am I thinking, right now? • How am I feeling, right now? • What am I doing, right now? • Am I thinking the way I want to think? • Am I feeling the way I want to feel? • Am I acting the way I want to act? If the answer to any of the above is no, don’t fret. Right now, this moment, you have the power and the ability to change the thought. Change the feeling, or at least manage the way you respond to the feeling. Change the behavior, or at least stop acting in a way you do not like. You can do something to manage your life. You can practice asking those questions several times a day. It’s okay to leave yourself sticky notes. It’s not necessary to rely on your memory to do this, because much of that is already a habit. Use reminders in whatever manner works for you. The important thing is to do it. The only way to get rid of an unwanted habit is to replace it with another one. You simply can’t jerk a habit out of your experience— nature abhors a vacuum! That’s the same thing as “trying to break” a habit. Unproductive habits need to be replaced. There is no shortcut. Once you are aware of the habituated activity you can, at that instant, replace it. The new action won’t stick immediately, of course, it’s not yet a habit. But with practice and persistence, it will. If the idea of replacing a habit is a little scary, then use another term. Supplant means for one thing to gradually take the place of another. Supplant is a gentle process. No sudden shocks, no dramatic shifts, just quiet, steady, consistent work, with a minimal of “Hands” type of discomfort. If you are prone to break habits, you may wish to supplant them. Don’t want to supplant them? Supersede them. Supersede means to set aside something obsolete and replace it with something new. Use that word and style if it works for you. Life is a great adventure for those who choose to participate.